Copyright © 2014 Rodrigo Pereira dos Santos et al. This is an open access article distributed under the Creative Commons Attribution License, which permits unrestricted use, distribution, and reproduction in any medium, provided the original work is properly cited. In accordance of the Creative Commons Attribution License all Copyrights © 2014 are reserved for SCIRP and the owner of the intellectual property Rodrigo Pereira dos Santos et al. All Copyright © 2014 are guarded by law and by SCIRP as a guardian. The software industry has evolved to a multiple-product development created on a platform and based on a common architecture integrated to other systems. This integration happens through components and third-party developers networks in Software Ecosystems (SECOs). Since systems and software development processes present challenges beyond the technical side, SECOs have emerged as an approach to improve the Software Engineering (SE) mindset in the industry. This fact changes the software industry as it requires the management of an integrated social-based environment to support a transition from an intra-organizational to an open business model approach towards a SECO approach. In this context, social networks can be important to coordinate a collaborative and distributed environment to develop SECOs platforms. This paper analyses the impact of social networks in SECOs through an integrated framework of the SECO and social network challenges. So, a proposal for a sociotechnical-based architecture to support the SECOs lifecycle is discussed. The development of information systems faces challenges that lie beyond the purely technical perspective. According to Bosch , this scenario requires professionals in the software industry that develop approaches to manage its consequences in the product and process complexity. Thus, developing an information system as a unique software product has been replaced by the development of multiple products. These products derive from a platform based on a common architecture and integrated with other systems via networks of software components and stakeholders worldwide . In this sense, the study of Software Ecosystems (SECOs) rises as a research topic in Software Engineering (SE) [3,4]. SECOs represent an approach to improve the comprehension of SE in an inter-organizational context as it focuses on the concept of a common platform based on reuse. SECOs also involve users and external developers in the software development process to open and evolve platforms in a decentralized way . Collaboration, communication and coordination mechanisms are required to develop SECOSs platforms through the computer-supported cooperative work (CSCW). So, some research works focus on the need of technologies to manage the collaborative development process for software in SECOs [6,7]. Amongst these technologies, social network sites are emerging as a new opportunity, i.e., Web 2.0 platforms, where people communicate with each other. 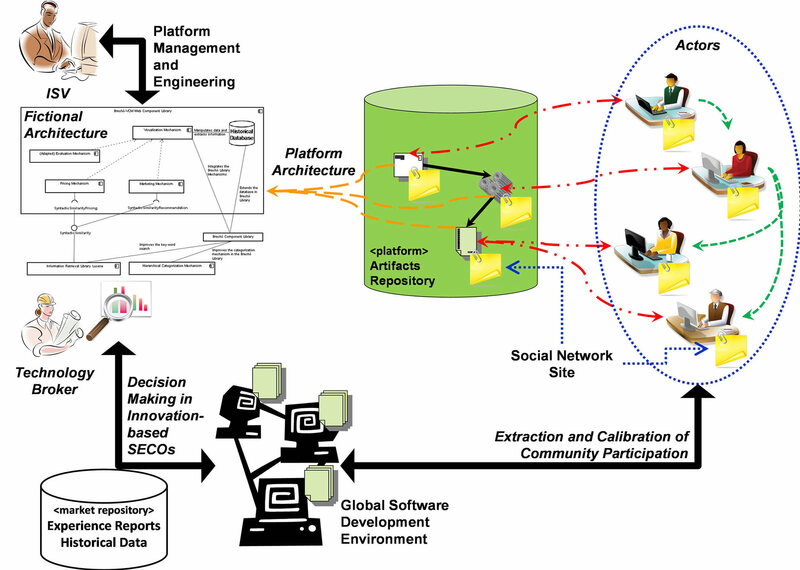 In the SECO context, these sites can be extended to create networks of software artifacts and actors (developers), named socio-technical networks . That is, software artifacts such as code, components, services, models, or documents can interact with actors and with other artifacts. These interactions highlight the importance of the associated documentation, more than that the teams involved in their creation . In spite of the benefits, how social network technologies can support the development of platforms in SECOs is a challenge, considering the aspects of CSCW, global SE, and free and open source software (FOSS). The set of tools provided by social network sites can be organized to explore some solutions . As pointed by Jansen et al. , social technologies should be evaluated, customized and integrated to SE environments and tools. In this sense, this paper analyses the impact of social networks in SECOs through an integrated framework of the SECO and social network challenges. A proposal for a sociotechnical architecture for the SECOs lifecycle is presented, based on open innovation and FOSS. In this sense, socio-technical networks are graphs of nodes (actors and artifacts) and edges (their dependencies). In turn, sociotechnical networks extend them to contemplate a multidisciplinary view, including other elements to analyze SECOs facts and artifacts based on the actor-network theory . This paper corresponds to an extended version of the work of Santos et al. , published in the I Brazilian Workshop on Social Network Analysis and Mining (BraSNAM). Apart from this introduction, the paper has the following sections: Section 2 covers the theoretical basis (SECOs and social networks); Section 3 discusses some related work; Section 4 presents a discussion on the impact of social networks in SECOs; and Section 5 concludes the paper and points out to future work. Since the treatment of economic and social issues is crucial for SE , the SECO perspective has led the main players in the software industry to reconsider their operating practices. They also need to open their platforms to external entities in order to guarantee the business goals and keep up with the speed of market innovation. However, the goal in SECO research is even broader, encompassing different facets of SE, such as software reuse, system architectures, CSCW, social networks, sociotechnical networks, software quality, and economics. So, this section presents the background of the SECO and of the social networks. A trend in SE consists of analyzing the birth, development, maturing, and eventual “death” of wider systems or platforms. In this case, the traditional boundaries between the entities in the development process have been deconstructed (or adjusted) to allow collaboration and interoperability amongst the parties . According to Messerschmitt & Szyperski , these systems have been a research topic in the community, named SECOs. According to Jansen et al. , a SECO represents a set of businesses functioning as a unit and interacting with a shared market for software and services, based on a common technological platform or market and operating through the exchange of information, resources and artifacts. Some examples are the MySQL/PHP SECO, the Microsoft SECO, and the iPhone SECO. These examples can be used to establish the typical characteristics of the SECOs. A SECO can be contained in other SECOs, such as the Microsoft SECO CRM, contained in the full Microsoft SECO. On the other hand, the iPhone SECO, with its AppStore, is a closed SECO, whereas the MySQL/PHP SECO is open, as the organizations have access to the source code and related knowledge bases. Well-known organizations, including Microsoft, Amazon, Nokia, Google, SAP, and Apple, lead the development of SECOs as pioneers. This contributes to the SECO research status, essentially conceived from the movements of the software and services industry. The main reason is that software vendors no longer work as independent units that deliver separate products, but have rather become increasingly more dependent of other vendors. The dependencies refer to the use of vital components and infrastructures, e.g., operating systems, libraries, and component and platform markets . Software vendors resort to a virtual integration through alliances that establish networks of influence and interoperability, naturally generating the SECOs. However, some challenges also emerge : 1) vendors need to be aware of the SECOs; 2) they want to have a perception of the survival strategies amongst the participants of their SECOs; and 3) they still need a general view of how the organization can open its platform to the SECO without losing intellectual property. Jansen et al. modeled SECOs on three levels, as shown in Figure 1. The first level, named organizational (independent software vendor, or ISV), aims at studying the actors and their relationships in the context of the organization inserted in a SECO. The goal is to study performance and evolution as factors related to SECO stakeholders. The opening process is a key issue, considering aspects of knowledge sharing with partners. Figure 1. 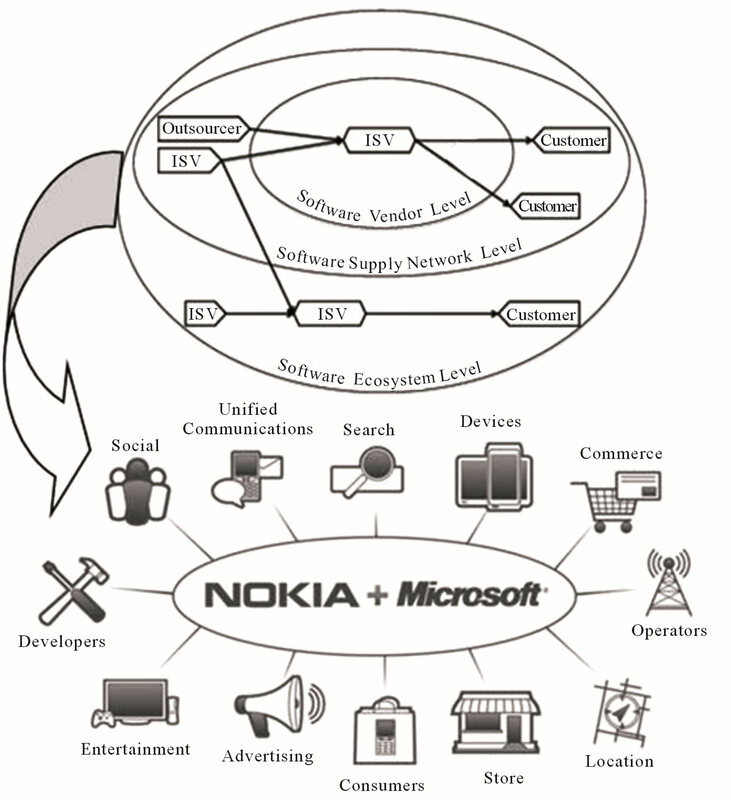 SECOs scope levels and an example of intersection between the Nokia SECO and the Microsoft SECO to create a new SECO. Sources: [3,17]. 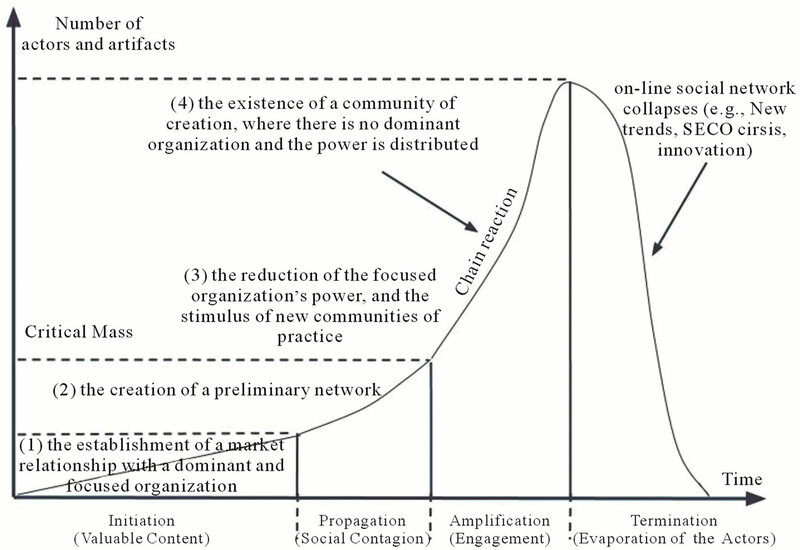 3) The reduction of the focused organization’s power, and the stimulus of new communities of practice; and 4) The existence of a community of creation, where there is no dominant organization and the power is distributed by the communication/participation of other ISV and SSN members, including consumers and users. • Gain in knowledge—storing and maintaining experiences, and opportunities for the parties interested in getting involved with new technologies and tools in a collaborative environment. A social network consists of a set or group of people with some pattern of connection or interaction between them . The graph theory has been used in the analysis of the social networks to check the social relations through graphs (sociograms). In this case, each connection between two points or nodes represents a relationship between pairs of individuals , and the edges are the specificities in the relationships. One of the first examples that prove the world is increasingly interconnected and smaller was the Milgram’s experiment. Milgram’s “six degrees” theory, as it was named, lies in the fact that two people distributed in the world have only a small number of intermediary connections, approximately six degrees of separation . The Internet and other technologies that support social networks such as Facebook, Twitter, and Google+, contribute to reduce the distances between people and increase the number of connections in the network. In a recent study produced by Facebook, it was found that the average degree of separation between two users is 4.74. When done in countries such as the US, Sweden, or Italy, the number of intermediary connections fell to 3.74 . In the early 1990s, the expression “social software” was created by specialist groups , defined as any website or application that connects people with similar interests and ideas, via Web . Its main motivation was the demand for functionalities that would allow people to connect through computers. Butterfield  says that social software combines devices that allow: creation of identity; identification of presence; establishing of relationships; conversation; and formation of groups (i.e., communities of interest). Webb  added two items to the original list: reputation, which allows the recognition of the personal status in a social network, and sharing, which allows the exchange of data and information, e.g., documents, photographs, videos, and links. This contributed for the concept of social networks, which started being defined by a representation of entities (e.g., people, companies), connected to each other via specific relations . Social network sites have been used to represent information systems with a large quantity of elements (people, points-of-sale, entities, equipment etc.) and their connection . They allow people, groups and organizations to carry out collaborative work through Web pages, online workgroups, and communities. An advantage is the visibility and mapping of connections between people, or between people and organizations. It is possible to access the knowledge of the members in a network, and sometimes their contacts’. This derived the concept of viral potential as a tool of social media and marketing as it has been used to connect people to the challenges of the corporate world. It also closes the gap between organizations and their stakeholders through communication channels that link agents, vendors, developers, and clients. 2) the novelty produces returns (financial and others) to the innovator as it is consumed by the society. The global software development beyond the organizational boundaries introduces new challenges to traditional SE processes, requiring a collaborative effort from several actors. Changes happen from a centralized to a decentralized management, which deconstructs the traditional intra-organizational software product line. It also involves new business models to support an open requirements engineering, with a collaborative process where clients suggest and vote for new features . Seichter et al. 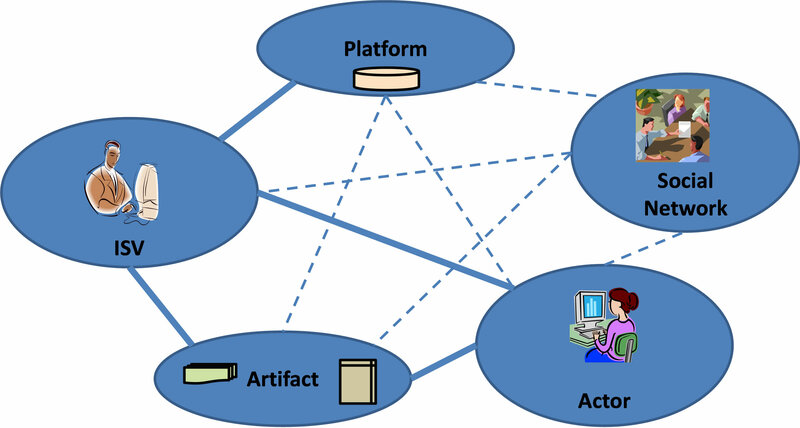 propose the use of social networks functionalities in the SECOs domain, specifying different types of relationships between artifacts and actors. In this case, the artifact should have a status of “first-class citizen” in an artifact sharing ecosystem. The goal is twofold: exchanging tacit knowledge between the different SECOs levels, and facilitating a software development artifacts management. Dealing with the shared and distributed knowledge becomes the SECOs challenge: 1) whenever new actors start participating in a SECO, the complex dependencies between shared artifacts should be informed to them in such a way; and 2) as the actors can leave the SECO at any time, this is associated to a loss of information. Possible scenarios are discussed in order to propose a prototype for social network sites to support the social lifecycle of SECOs. The idea is to allow new actors to obtain the information for their engagement. Also, it helps reducing the “knowledge drain” when one or more actors/artifacts leave, aiming at making the knowledge visible. There are eight social elements that support a SECO in the construction of a “social network site”, making the sociotechnical network feasible : Profile; Wall; New Feeds; Data Sharing; Teaming; Searching; Suggestion; and Messaging. Besides, the communication in a sociotechnical network is focused on the knowledge the actors wish to share amongst themselves, but also on the artifacts exchange with one another (e.g., software components) and with the other SECO actors. Thus, some social benefits appear: the reuse of artifacts, the generation of a new product, communication, and updates (Table 1). According to Seichter et al. , social networks sites in SECOs allow the visualization of the flow of knowledge and the understanding of the actors’ tacit knowledge. It also promotes an easy artifacts management as it relates actors to tools/artifacts such as architecture, components, and products. • Member of: classifies SECO actors and artifacts in groups of interest as it happens in the online social network sites, linking developers, users, models, code, services or documentation in a single context. Begel et al. presented a proposal for the construction of a social network for codes named Codebook. The authors also proposed a framework for social network in the Web in order to help software developers to hold connections with their peers. Codebook aims at discovering the relations between people, codes, bugs, test cases, specifications, and other related artifacts through the mining of any type of software repository. It can be tailored to specific uses (e.g., managers with an in-depth knowledge of the team and the software). On the other hand, Capuruço & Capretz  proposed a model for a Social Ecosystem Recommender. This recommender includes modules that manage the time and context dependencies and suggest interactions among the members. Despite the progress in applying the recommender, the model is restricted to the relations among the actors, considering their relations through time and in the context they occur in. Therefore, the authors did not model any kind of artifact related to the members, or even foresee an extension to identify proximity between actors and artifacts. The range of social networks opportunities incites the organizations to act and interact beyond their boundaries, through the creation of groups or communities related to their business. Since the resources to connect people based on common interests form these networks, social network sites can expand the SECOs social capital, as a social media or as a channel for communication and marketing. So, these sites can approximate software components, products and services, as well as stakeholders. This section discusses the use of social network concepts and technologies considering the SECOSs challenges, as well as a proposal for a sociotechnical based architecture to support the SECOs lifecycle, based on this discussion. Table 1. Types of interaction between networks of actors and networks of artifacts. Adapted from [7,29]. work initially aims at studying the use of online social networks to improve the SECOs social capital. The idea is to strengthen relationships among the concepts and produce the “glue” that holds the actors connected by virtual communities. The analysis confronted the technical and business challenges faced by the SECOs, as presented by Jansen et al. , aimed at acquiring an environment for a sociotechnical network. These challenges were grouped considering the three scope levels of the SECOs (Section 2.1). However, only the most relevant challenges were analyzed, i.e., those related to the social networks. 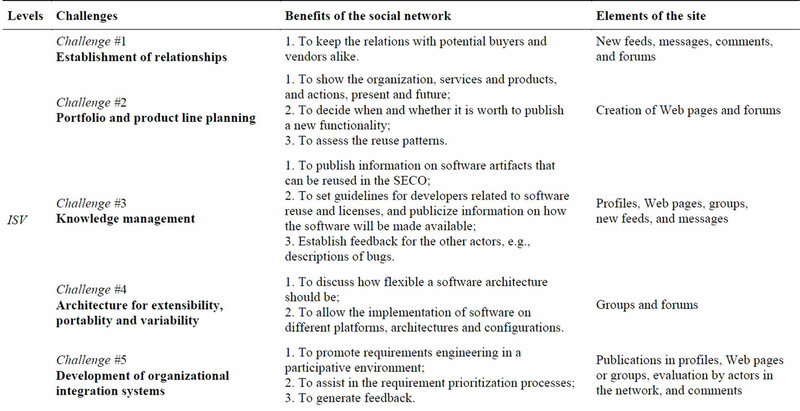 Table 2 shows the integrated framework of the SECO and social network challenges, discussed in the following paragraphs. On the organizational level (ISV), focused on the organization that creates, models and programs software functionalities within the SECOs, where five challenges were listed: 1) establishing and maintaining relations between vendors and buyers active, as it happens among friends in a social network; 2) creating a portfolio and product line planning; 3) determining how much knowledge and software will be shared and reused as open code functionality, which requires clear guidelines related to the types of software and underlying licenses; 4) developing an architecture based on extensibility, portability, and variability; and 5) developing integration systems in the organization. Table 2. An integrated framework of the SECO and social network challenges. Extended from Jansen et al. .
among software, hardware, and organizational services, in order to meet the market demands. This level has three challenges: 1) how a developer (vendor) should choose when to become active in the social network and so visualize potential buyers and suppliers via the profile notice board, where data is publicized; 2) how vendors and buyers receive this information through the new feeds (as updates of friends in social networks); and 3) how clients and partners create new solutions and can commercialize them within the SECOs. Finally, on the SECOs level, three challenges are pointed by Jansen et al. , but only the first one was considered in the analysis: 1) creating policies and strategies to orchestrate social participation on the many levels of the SECOs in a balanced manner; 2) characterizing and building a business model for the SECOs; and 3) modeling the sociotechnical network and generating value from the use of social software and from the creation of an fertile environment to connect people and artifacts through the Internet. Considering the analysis presented in Section 4.1, the SECOs context shows the pressure organizations face to open up their platforms. This paradigm shift has affected the relationship of the organizations with the SSN, generating a transition from an intra-organizational to an open business model towards a SECO approach. The need lies in the creation of a business model that supports the entry of new actors and artifacts in the SECOs, in a global and scalable way. This research proposes the use of existing online social network sites, such as available functionalities and resources, and recommender algorithms. The goal is to increase the interaction among actors and artifacts, adding value to their relationships in a sociotechnical network. In this sense, social network sites can allow the registration and interaction between SECOs actors and artifacts, on both organizational and SSN levels. Both actors and artifacts have been raised to the status of “first-class citizens” and, therefore, both are objects in the formation of social networks in SECOs. Figure 2. Relation between the use of a social network in SECOs and their lifecycle. Derived from . 4) Termination: usually, a service in an online social network is terminated due to saturation, or replacement with a new service, or still because new markets and trends arise. The novelty can produce an “evaporation” of the network members. It can be the result of a termination or a SECO break off. In order to facilitate the adoption of a model for open innovation, a new player can be incorporated into the Propagation stage: the broker or hub. Technology brokers, as they are known, play the role of facilitating the meeting of supply and demand. They add the right stakeholders aiming at fomenting the support and coordinating the collaborative work among the different SECOs scope levels. This is shown in Figure 3 and in Figure 4. First of all, Figure 3 illustrates the traditional process of closed innovation, i.e., each ISV conceives its innovations within the company, which owns the platform. In this case, the ISV centralizes the main relationships with the nodes and the other relationships are underlying connections. 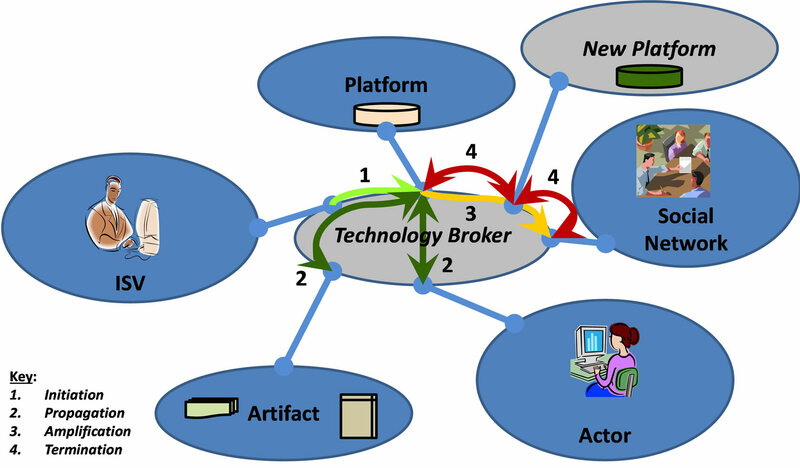 On the other hand, Figure 4 shows the process of open innovation, through alliances that establish networks of influence, participation and interoperability among actors and artifacts, naturally generated within the SECOs. In this case, technology brokers act as mediators or evaluators of the different stakeholders with the purpose of producing reports or carry out actions. Also, all relationships are very crucial for the SECO. Finally, Figure 5 presents a proposal of a sociotechnical based architecture to support the SECOs lifecycle, derived from a proposal by Santos & Werner . It consists in i) providing an environment to work with the social lifecycle of the SECOs, ii) considering the global SE environment, focused on the underlying sociotechnical network, and iii) make the management of the open innovation process real. This solution is centered on a data warehouse, structured around the artifacts repository involved in a SECO, i.e., applications, software components, and related services, as well as the relationships with the stakeholders (actors). Figure 3. Innovation sources in a closed ISV. Adapted from . Figure 4. Innovation sources in an open SECO. Adapted from . Figure 5. A sociotechnical environment for supporting SECOs lifecycle. The fictional architecture is just a draft and its detailed elements should not be syntactically or semantically considered. Derived from . for innovation. Also, technology brokers can manage the utilitarianism and the promotion, based on the analysis of the external developer networks that gravitate around the SECO platform. Thus, some contributions may be valuable to SECOs health : i) sustainability, i.e., the capacity to survive when actors and artifacts leave a SECO, and ii) diversity, i.e., the ability to provide opportunities of innovation and R&D in a SECO. Software development has been gradually turning to the composition of existing components developed internally by the organization, or of a commercial origin, or even through the use of FOSS or crowdsourcing (i.e., large groups of actors participating through an open call). So, SECOs have emerged as a research and practical topic in SE in order to treat economic and social issues in the software industry. In this scenario, social network sites can create a virtual environment that facilitates the adherence of new actors and artifacts and expands knowledge sharing on software components (useful to both developers and users). They also provide means to publicize and build SECO engagement, reaching a large number of vendors, clients, distributors, and third-party developers. This paper presented an analysis of the use of social networks in SECOs through an integrated framework of the SECO and social network challenges. A proposal for a sociotechnical based architecture to support the SECOs lifecycle was also discussed. As a contribution to the social networks and SE communities, we can highlight the feasibility in researching a social SE through SECOs. As comprehension is a critical problem for SECOs, social networks research can support decision-making in software development in extending analysis and visualization techniques. As future work, 1) we intend to carry out an experimental study (survey) with specialists in SECOs to refine the proposed environment; 2) we intend to generate a second framework to assess the SECOs, position them in their lifecycle based on the social perspective; and 3) we intend to implement a tool to support this framework and the proposed environment based on an existing social network (e.g., Facebook), on an artifacts repository (e.g., Brechó ) and on a development tool (e.g., Eclipse) aimed at integrating it in the software development process with SECOs. We thank CNPq, CAPES and FAPERJ (Brazil) for their financial support for this research. J. Bosch, “From Software Product Lines to Software Ecosystem,” Proceedings of 13th International Software Product Line Conference, San Francisco, 2009, pp. 1-10. R. P. dos Santos and C. M. L. Werner, “A Proposal for Software Ecosystems Engineering,” Proceedings of the 3nd International Workshop on Software Ecosystems, 2nd International Conference on Software Business, Brussels, 2011, pp. 40-51. S. Jansen, A. Finkelstein and S. Brinkkemper, “A Sense of Community: A Research Agenda for Software Ecosystems,” Proceedings of the 31st International Conference on Software Engineering, New and Emerging Research Track, Vancouver, 2009, pp. 187-190. R. P. dos Santos, C. M. L. Werner, O. A. L. P. Barbosa and C. F. Alves, “Software Ecosystems: Trends and Impacts on Software Engineering,” Proceedings of the 26th Brazilian Symposium on Software Engineering, Special Track “Grand Challenges in Software/System Engineering”, Natal, 2012, pp. 206-210. R. P. dos Santos and C. M. L. Werner, “Treating Business Dimension in Software Ecosystems,” Proceedings of the 3nd ACM/IFIP International Conference on Management of Emergent Digital EcoSystems, San Francisco, 2011, pp. 197-201. R. A. C. Capuruço and L .F. Capretz, “Integrating Recommender Information in Social Ecosystems Decisions,” Proceedings of the 4th European Conference on Software Architecture, 2nd International Workshop on Software Ecosystems, Copenhagen, 2010, pp. 143-150. D. Seichter, D. Dhungana, A. Pleuss and B. Hauptmann, “Knowledge Management in Software Ecosystems: Software Artifacts as First-Class Citizens,” Proceedings of the 4th European Conference on Software Architecture, 2nd International Workshop on Software Ecosystems, Copenhagen, 2010, pp. 119-126. R. P. dos Santos and C. M. L. Werner, “Treating Social Dimension in Software Ecosystems through ReuseSECO Approach,” Proceedings of the 6th IEEE International Conference on Digital Ecosystem Technologies, Campione d’Italia, 2012, pp. 1-6. B. Latour, “Science in Action: How to Follow Scientists and Engineers through Society,” Harvard University Press, Cambridge, 1988. R. P. dos Santos, M. G. P. Esteves, G. S. Freitas and J. M. Souza, “Utilizando Redes Sociais Para Apoiar os Ecossistemas de Software,” Proceedings of the I Brazilian Workshop on Social Network Analysis and Mining, XXXII Brazilian Computer Society Congress, Curitiba, 2012, pp. 1-4. B. Boehm, “A View of 20th and 21st Century Software Engineering,” Proceedings of the 28th International Conference on Software Engineering, Shanghai, 2006, pp. 12-29. P. R. J. Campbell and F. Ahmed, “A Three-Dimensional View of Software Ecosystems,” Proceedings of the 4th European Conference on Software Architecture, 2nd International Workshop on Software Ecosystems, Copenhagen, 2010, pp. 81-84. D. G. Messerschmitt and C. Szyperski, “Software Ecosystem: Understanding an Indispensable Technology and Industry,” The MIT Press, Cambridge, 2003. V. Boucharas, S. Jansen and S. Brinkkemper, “Formalizing Software Ecosystem Modeling,” Proceedings of the 1st International Workshop on Open Component Ecosystems, ACM SIGSOFT Symposium on the Foundations of Software Engineering, Amsterdam, 2009, pp. 41-50. S. Jansen, S. Brinkkemper and A. Finkelstein, “Business Network Management as a Survival Strategy: A Tale of Two Software Ecosystems,” Proceedings of the 1st International Workshop on Software Ecosystems, 11th International Conference on Software Reuse, Falls Church, USA, 2009, pp. 34-48. M. Costa, “Análise de Redes Sociais,” Mini Paper Series 3, Technology Leadership, 2008. S. Milgram, “The Small-Word Problem,” Psychology Today, Vol. 1, No. 1, 1967, pp. 61-67. H. W. Chesbrough, “Open Innovation: The New Imperative for Creating and Profiting from Technology,” Harvard Business School Publishing Corporation, 2003. M. A. Schilling, “Strategic Management of Technological Innovation,” 2nd Edition, McGraw Hill, New York, 2008. A. Begel, K. Y. Phang and T. Zimmermann, “Codebook: Discovering and Exploiting Relationships in Software Repositories,” Proceedings of the 32th International Conference on Software Engineering, Cape Town, 2010, pp. 125-134. C. Russ, “Online Crowds—Extraordinary Mass Behavior on the Internet,” Proceedings of the i-Media, Graz, 2007, pp. 65-76.